One of the most common issues that consumers face with a refrigerator is cold air loss. Since research has found that individuals open their refrigerator door an average of 79 times per day, cold air wastage and, ultimately decreased electricity-savings remain an inevitable aspect of our refrigerator experience. In order to resolve this concern, LG has designed a lineup of InstaView Refrigerators that prevent the escape of cold air and conserve energy by incorporating a revolutionary knock-on glass panel. Presenting a unique synergy between exquisite design and impressive functionality, the LG InstaView Door-in-Door function comprises of a sleek 33-inch glass panel that illuminates the interior when knocked on twice. This enables the consumer to view the items inside the refrigerator without having to ever open the door. Plus, the Door-in-Door compartment provides easily accessible storage for frequently used groceries or beverages, offering the utmost in flexibility and convenience. Both factors work together in perfect cohesion to reduce cold air loss up to 41%, resulting in more energy being saved. 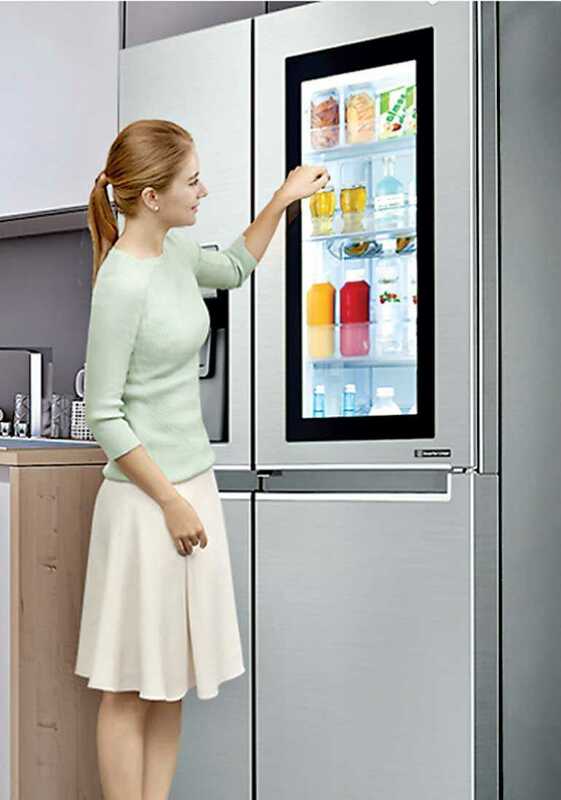 Another striking feature included in these refrigerators is the Inverter Linear Compressor. Employing a streamlined linear piston drive that uses a simple linear motion and produces just one friction point, the Inverter Linear Compressor reduces the temperature fluctuations within the refrigerator to keep food fresh for up to seven days. Plus, the compressor lowers the refrigerator’s energy output up to 42%, cutting down the costs of electricity bills. Further, impeccable hygiene and pure air are other essential elements that preserve the freshness of groceries for longer. The progressive Hygiene Fresh+ filter system combines both to deliver a refrigerator that keeps food fresh and crisp. Using a five-stage air filtering system, the Hygiene Fresh+ focuses on wicking away moisture and odors emitted by vegetables, fruits, proteins and cooked food as well as cleansing the air within the refrigerator of foreign impurities. Additionally, the technology eliminates 99.9% of four different types of bacteria and mold, which safeguards against quick food spoilage. So this saves you the time and money spent on extra grocery trips as well as assures you that the food in your refrigerator remains safe and healthy enough for your family to eat. The innovative LG InstaView Refrigerator range is available for purchase at all Abans and Abans Elite Showrooms island-wide.